As I have said in the past, video game movies do not really work. This goes back many a year, even to 1989’s “The Wizard,” wherein they tried to give TV’s “The Wonder Years” Fred Savage his own chance at becoming a matinee idol. I think his appearance as the sick kid in William Goldman and director Rob Reiner’s” The Princess Bride” landed to more of his credibility as a name to remember. 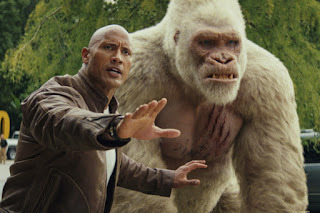 But, I digress, since we are here to know about “Rampage,” the new “based on a video game” tale that finds George, a gorilla who can actually communicate via sign language. He was rescued by Dwayne Johnson’s Davis Okoye, who saved George many a year ago when he was still a baby. George is not the only genetically altered animal on the planet, since there is a wolf as well as a crocodile. Also adding further credibility to this moronic yet fun movie is Naomie Harris. She was the new Moneypenny in the last James Bond entry, “Spectre.” Her part is that of a brilliant scientist wgo for all intents and purpose was fired from her last job due to some insider shuffling at the top. As disappointing as far as movies go, this one had some weight and gravitas in pooling all the plot points together. One of the characters thought to be an adversary turns out to be a good guy. Jeffrey Dean Morgan plays Harvey Russell, a government higher-up with some clout in getting things done immediately and ASAP. This flick acknowledges the ridiculous proceedings, such as when Johnson’s Okoye states that of course the wolf flies. Of course there are plenty of Mcguffins thrown into the mix. With “Rampage,” the director is Brad Peyton, who has steered Johnson to some big hits, namely “San Andreas” in 2015. He also directed him in “Journey 2: The Mysterious Island,” in which his character replaced Brendan Fraser. ”They are occasionally crass and rude, but it’s what the audience paid to see in this bona-fide definition of a guilty pleasure.